A Cook County judge dismissed charges against Chicago Police detective Dante Servin in the death of 22-year-old Rekia Boyd in 2012. 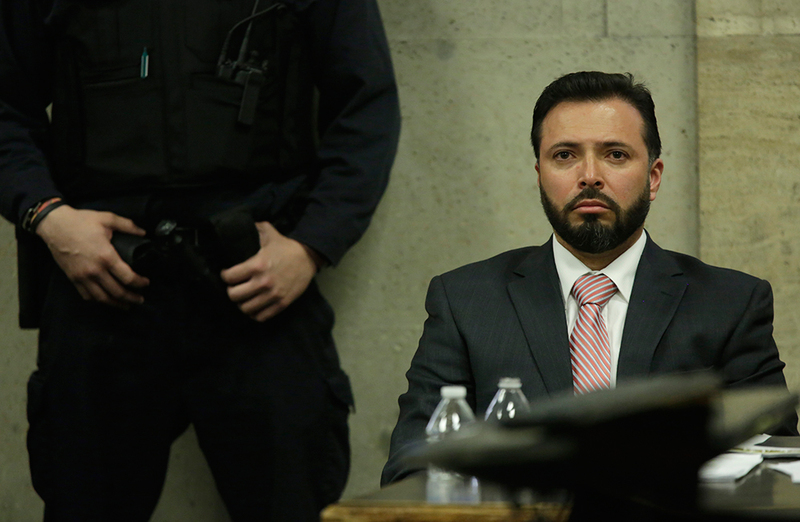 Leading up to the trial of Chicago Police detective Dante Servin, Martinez Sutton had put his faith in the idea that “the justice system works.” Sutton was hopeful that Servin would be convicted in the death of his 22-year-old sister, Rekia Boyd. But he understood that the bar was high: A Chicago police officer hasn’t been convicted of fatally shooting a civilian since 1997. On Monday, a Cook County judge threw out charges against Servin, who faced four felony counts including involuntary manslaughter, reckless conduct, and two counts of reckless discharge of a firearm in the 2012 shooting of Boyd near a West Side park. At issue was whether Servin acted recklessly. Later that day, Sutton said he couldn’t remember what he screamed after hearing the judge’s decision. His emotions were too overwhelming. Sutton was pulled from the courtroom by family, supporters and sheriff’s deputies. The shooting of Boyd, a young African-American woman, ignited tensions in Chicago and fueled activists’ calls for police reform and prosecutions of alleged police misconduct long before the deaths of Michael Brown and Eric Garner. Supporters of Boyd’s family and Servin were fixtures in Porter’s courtroom during the short trial. To make the charges against Servin stick, prosecutors had to prove that he did not intend to kill Boyd and acted recklessly when he shot into a crowd. Porter ruled that prosecutors fell short of that standard and raised questions about the Cook County State’s Attorney’s decision to charge Servin with involuntary manslaughter in the first place. State’s Attorney Anita Alvarez said her office provided sufficient evidence to prove that Servin’s conduct was reckless and that “justice was denied” in the case. Boyd was socializing with a group of friends when they got into an argument with Servin, who was off duty. A member of the group allegedly pointed a cell phone at the detective. An unarmed Boyd was struck in the back of the head when Servin, who was in his car, fired shots at her companions, according to the State’s attorney’s office. Darren O’Brien, Servin’s lawyer, said his client thought he was in danger of being shot and fired in self-defense. Craig Futterman, a University of Chicago law professor who has worked on police abuse cases, said it was noteworthy that Servin, 46, was charged in the first place. Chicago police shoot on average about four people a month, Futterman said, but prosecutions are rare. He credits a growing movement for police accountability. Absent hard evidence, any case that relies on the credibility of witness accounts tends to favor police, he said. “Officers of the law start with an advantage in that most all of us want to believe and need to believe that the people who we entrust with the powers to arrest, the powers to take our liberties, the powers to use force, the powers to shoot and even kill, that those officers would not exercise those powers lightly,” Futterman said. Monday night, about 20 supporters of Boyd and her family gathered in North Lawndale by Douglas Park, where Boyd was walking from with friends the night she encountered Servin. From there, they marched onto the street where she was shot and bowed their heads for a moment of silence. Charges against a police officer are rare, convictions are even rarer. Between April 2009 and December 2010, the National Police Misconduct Statistics and Reporting Project found that of 2,716 officers accused of using excessive force, only about 200 were charged and 77 were convicted. About 30 of the nearly 430 officers accused of killing a person using excessive force were charged. Only half were convicted. Now that the court case is over, the Independent Police Review Authority will continue an investigation into the shooting. The investigation had been put on hold in lieu of criminal proceedings, police said. The Authority has the power to investigate and recommend discipline for officers to the superintendent of police, including firing. Sutton said the family wants the U.S. Justice Department to investigate the case. In 2013, Boyd’s family received a $4.5 million settlement from the city in response to a wrongful-death suit. But Sutton said his family doesn’t gain much solace from the settlement. Kim Foxx won votes across race and class lines in Cook County, drawing on push for police reform. The March 15 Democratic primary could be a referendum on Anita Alvarez’s handling of officer-involved shootings and send a message to prosecutors across the country. ~ The good brave officers with integrity deserve better. And so does the public………………..